It can be tough to keep up with the many allegations of misconduct circulating about Environmental Protection Agency chief Scott Pruitt, because there’s so many of them flying out the door. Over the past few months alone, internal EPA teams have failed to identify any credible threats that would justify Pruitt’s $3 million budget for 24/7 security and expensive flights, the agency has grown increasingly authoritarian and hostile to climate science, and Pruitt reportedly wined and dined a Catholic cardinal accused of sexual abuse because they both were climate change skeptics. But this week, two more new eyebrow-raising about Pruitt emerged: One, that he’s spent an awful lot of money on fancy pens, and two, that his very cozy relationship with coal billionaire Joseph W. Craft III has included exchanges of college basketball tickets. However the agency chooses to justify the pen purchase, it’s all in the context of an EPA chief who has spent dramatically more on luxuries than any of his predecessors and has a tendency to lie about those spending habits. The second incident is much more revealing: According to the New York Times, the EPA says Pruitt paid Craft $130 for two seats reserved for seasonal ticket-holders who have donated at least $1 million to the University of Kentucky at one of the school’s biggest basketball games of the season—in cash, so there’s no receipt of Pruitt actually buying them rather than just wetting his beak a little. Mr. Pruitt’s attendance at the game, the details of which have not been previously reported, followed a year of regulatory victories for Mr. Craft, who maintains close ties to Mr. Pruitt even as he has lobbied the E.P.A. on issues important to his company, Alliance Resource Partners. A major contributor to Mr. Pruitt’s campaigns in Oklahoma when Mr. Pruitt served in state government, Mr. Craft saw Mr. Pruitt at least seven times during his first 14 months at the E.P.A., agency records and emails show, and they were scheduled to appear together on at least two other occasions. That is more than Mr. Pruitt has met with representatives of any environmental group. 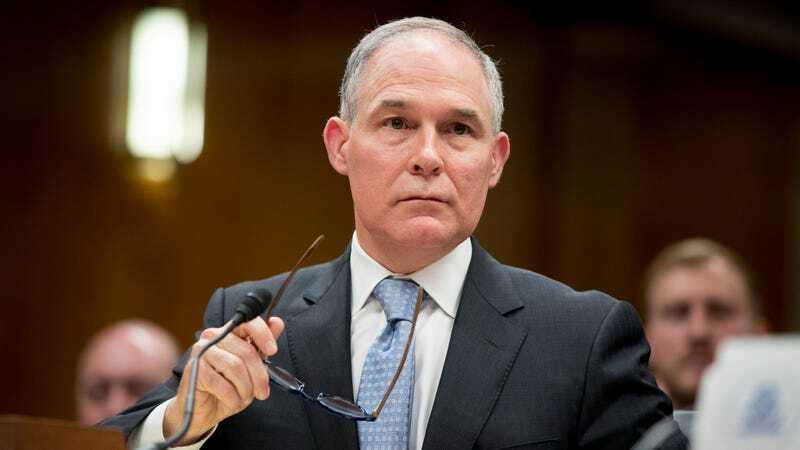 Other times Pruitt has hung out with Craft include at the Ritz-Carlton resort in Florida during a National Mining Association board meeting (where he allegedly urged them to publicly support pulling out of the Paris climate accord) and the time Pruitt met with the board of Craft’s company at the Trump International Hotel, the Times added. Unlike those meetings, however, the Times wrote Pruitt’s trip to the basketball game was left off official schedules (even though he was accompanied by his 24/7 federal security detail as well as state police). Though pressure has been mounting around Pruitt’s various scandals for months—accompanied by around a dozen ethics investigations—the White House has more or less indicated that it is willing to tolerate the bad news because Pruitt has been very successful at pursuing his deregulatory agenda.